Did you feel that? It was as if millions of productive work hours just cried out in pain and then were silenced. Tiny Tower is one of the most addictive mobile games ever made. Star Wars is Star Wars. This combination, teased via the Star Wars Twitter account, is the death of productivity. The Empire needs your help! In collaboration with LucasArts and Tiny Tower creators NimbleBit, Disney Mobile introduces Star Wars: Tiny Death Star, a new game for mobile devices. Live life on the dark side and join Emperor Palpatine and Darth Vader on a mission to attract Galactic bitizens, run intergalactic businesses, and build an all-new Death Star. Construct unique Star Wars themed locations to attract iconic characters and species to your space station in this 8-bit style game. 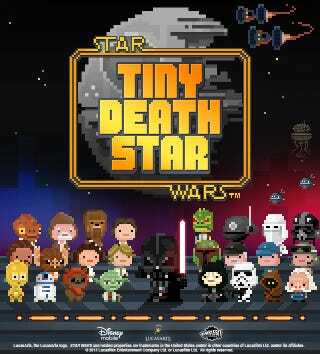 Star Wars: Tiny Death Star will soon be available worldwide. I fully expect the NimbleBit team to be wearing black robes and choking people from across the room by the time Star Wars: Tiny Death Star is finished.